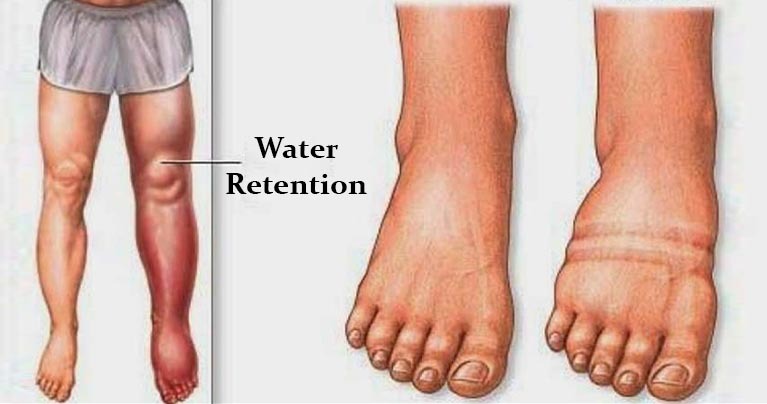 The water retention is also known as Edema, mostly is followed by swelling in the hands and in the legs. It is a condition in which our cavities tissues and circulatory system are accumulating fluids. Mostly edema is caused during the period of pregnancy, or if you are under some medications, if you are physically inactive, during the premenstrual period, and sedentary lifestyle as well. It is not a very serious disease you should panic about, but it can sometimes provide the appearance of a kidney disease, or even heart failure. Water retention can sometimes be caused from magnesium deficiency. According to researches women who are in the premenstrual period, are having reduced magnesium levels by 200 mg on daily basis. Therefore, it would be wise to consume foods that are rich with magnesium such as, spinach, dry fruits, nuts, peas, whole grains, dark chocolate, avocados and a lot of dark-green vegetables. When the body is dehydrated, it starts to retain water, which can very often be accompanied by swelling in some body parts. Which is why you want to avoid drinks that are high in caffeine, soda drinks, and drink plenty of filtered water. Vitamin B6 deficiency, is very likely to cause water retention. A study that was published in the Journal of Caring Sciences in which the participants were only women who had dealt with water retention as a result of their premenstrual syndrome. And they managed to improve their situation only by increasing the intake of vitamin B6. Also the levels of vitamin B6 can be maintained by consuming foods like, dry fruits, turkey, bananas, chicken, sunflower seeds, tuna, potatoes, pistachio nuts, and lean beef. When you are consuming foods that are high in sodium, and you are not supplying your body with the amount of water it needs, your body starts to accumulate water which later causes the appearance of edema. Therefore, you want to avoid foods such as, processed meat, canned vegetables and some condiments, and limit the intake of table salt. Instead of consuming the table salt, replace it with Himalayan and Celtic sea salt. Processed foods contain a lot of sodium and sugar, which can cause the development of edema. Also there are additives that are contained in the processed foods which can be very toxic for our bodies. These toxic additives can cause overburdens in our liver and our kidneys. Since the potassium is improving the function of our tissues, balances our water levels, and improves the functions of every cell and every organ in our body, you want to increase the intake of it. Therefore, if our levels of potassium are critically low, this may lead to water retention as well. If you are dealing with edema, you want to increase the intake of foods that are high in potassium, because this will lower the levels of sodium as well. You can increase the consumption of foods such as, rock melons, watermelons and honey melons.